The performance, reliability, and cost of a product strongly depend on the properties of the materials that comprise the product. Proper selection of the materials is crucial to satisfy product performance, reliability, and cost requirements. Controlling materials’ properties variations is crucial for enabling consistent product performance, reliability, and cost. The concepts presented are concerned with the engineering considerations for optimizing materials to enable a product to meet its performance, reliability, and cost requirements. These considerations apply to many decisions made during product design and manufacturing. While there are many books on materials selection, most cover only the physical and mechanical properties of specific materials. Also, they do not discuss how materials selection and control of materials properties is influenced by design and manufacturing decisions. There are also many books on product development, but those books primarily discuss product development from the mechanical engineering perspective, and overlook the fact that a product is an assemblage of materials. 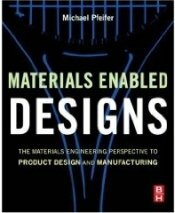 This book will be useful to design, manufacturing, and quality engineers. It will also be useful to engineering managers and business leaders looking for strategies for reducing product development time, improving product performance and reliability, and reducing costs.